After 30 years of running my graphic design business I decided to revisit my passions for painting, carving and surfing. Moving to Waihi Beach (New Zealand) in 2014, has created an opportunity for me to follow my dreams and develop my work as well as meeting some interesting people. I am developing my style by simplifying scenes and graphic shapes to express my interests of native wilderness, environment, wildlife, Maori whakapapa and the love of the ocean. I am using repetition, ordered composition and bright colours in my artwork to reinforce my style and add colour and fun to people’s homes and offices. I studied at the School of Design in Wellington and was inspired and influenced by artists such as Robin White, Rita Angus, Colin McCahon and other leading New Zealand painters. 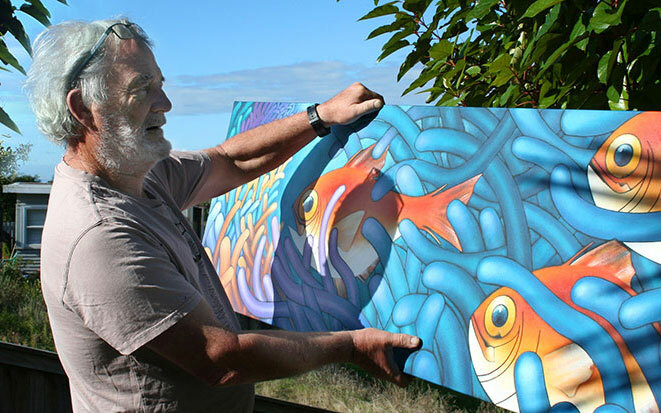 I sell my artwork through galleries in the Waikato, Coromandel and Northland regions of New Zealand. I have also sold overseas and successfully exhibited in London. Recently I opened a small gallery called Gallery27 at home, to sell my artwork and have an outlet that allows people to see a variety of my artwork in one place. Gallery27 contains original paintings as well as framed and unframed prints. I am also available to do paintings on commission in the style of my artwork. Although I have been focusing on my painting in recent years, I am still providing graphic design services, eg: Packaging, Branding, Print and Signage etc. You can view selected examples on the Graphic Design page, or visit my old website which has a wider range of design examples. Please note, my old website is not supported on mobile or tablet devices. If you’d like to purchase any of my original paintings, prints or carvings. Or have a creative idea that you’d like to commission me to create for you. Or even just to chat – I’d love to hear from you!